Soft & chewy cookies rolled in a blend of chai spices and covered in creamy vanilla bean frosting. 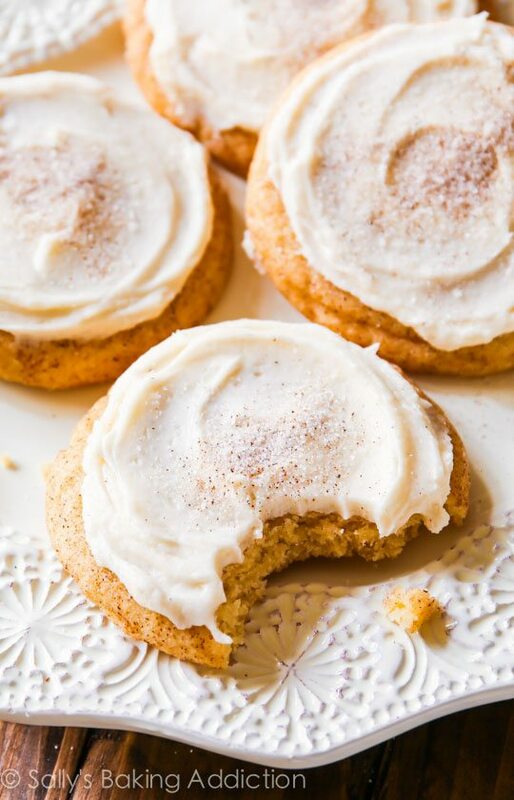 These frosted chai spice snickerdoodles are a chai tea latte in cookie form! Hopefully some candy bar blondies or reese’s stuffed cookies are on your agenda with all that leftover Halloween candy. My plans include eating today’s chai spice cookies, washed down with a few of these pumpkin ales, cozy by the fire in the Poconos. A weekend at the lake with friends and blankets and pumpkin beer and cookies… sounds like perfection. If you’re a fan of chai tea lattes, add a batch of these fabulously spiced chai cookies to your agenda too. I’m so excited about these! First, because this recipe is breaking my near two month cookie-less streak. Sorry for dropping the ball on new cookie recipes! And second… chai. I have been a huge fan of chai tea for years. Bold and spicy, this flavorful tea is my#1 choice when it comes to warm drinks. And baking with its spices seemed like a natural progression. Have your chai tea and eat it too. Today’s cookies are snickerdoodle cookies. 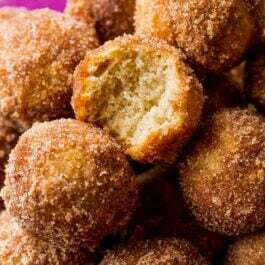 Prepare a buttery dough, roll cookie dough balls in a cinnamon sugar mix, and bake. These are so simple! I use the same exact snickeredoodle cookie recipe as I do with my caramel surprise snickerdoodle cookies. Thick, soft, and very chewy. No mixer required and minimum dough chilling time. 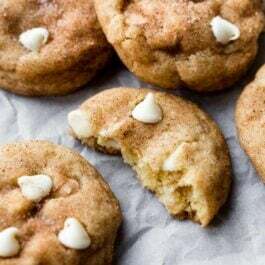 But instead of just cinnamon and sugar, I add a trio of flavorful chai spices to the cookie’s coating: ginger, cardamom, and allspice (which includes both nutmeg and clove flavors). Chai tea is flavored with a couple other spices as well: black pepper and Chinese star anise. I already added black pepper to one dessert this week and you probably already consider me crazy from that. So, I left out the pepper in these frosted chai snickerdoodles. And I couldn’t find Chinese star anise for the life of me in about 7 different grocers. So cinnamon, ginger, cardamom, and allspice are what I used. And we loved the flavor! 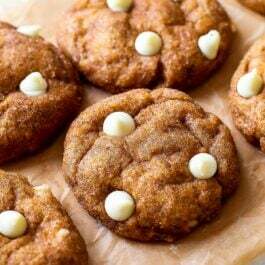 When I began brainstorming this chai-infused recipe, I wanted something a little more than a snickerdoodle-type cookie. The answer? A swirl of frosting. Frosting is always the answer. Vanilla bean frosting… smooth and creamy, flavored with vanilla extract and vanilla beans. The vanilla beans put this frosting over the top! I like to add a pinch of salt to the frosting. There is so much sweetness happening in the cookie and the cookie’s chai spice coating, that a little salt is welcomed in the sweet frosting on top. Feeling like something a little more simple? Feel free to leave off the frosting. 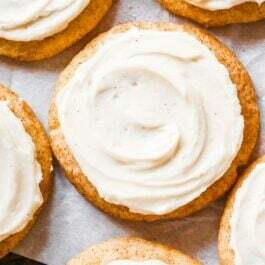 But I must tell you– the chai spice cookie paired with the vanilla bean frosting reminds me of a sweet ‘n spicy, creamy chai tea latte. 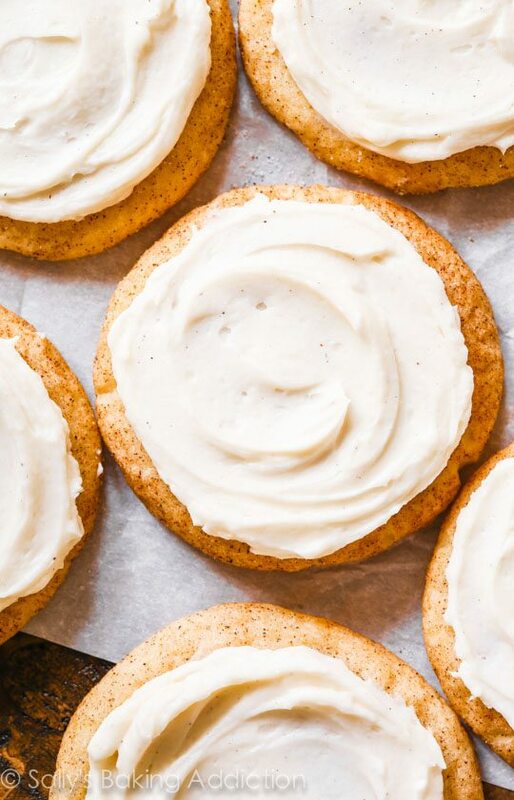 A chai tea latte in cookie form, if you will. Scary good. 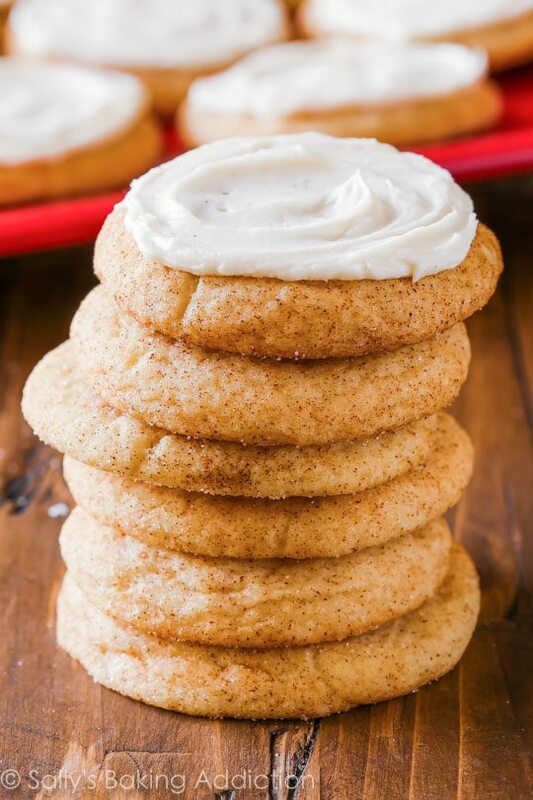 Soft & chewy snickerdoodles rolled in a blend of chai spices and covered in creamy vanilla bean frosting. 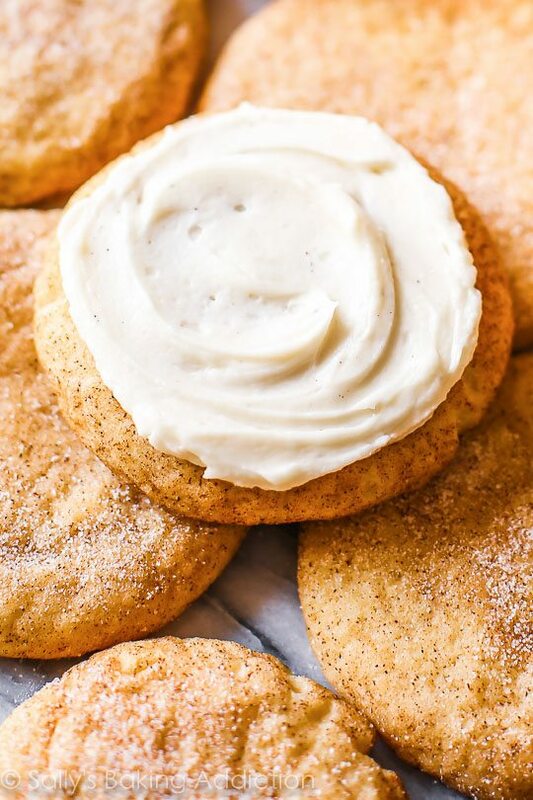 These frosted chai spice snickerdoodles are a chai tea latte in cookie form! When you take the butter out of the refrigerator to make the cookie dough, take out 1/2 cup more (1 stick) and allow to soften as you make the cookies. This softened butter is for the frosting. For the cookies: Toss the flour, cream of tartar, baking soda, cinnamon and salt together in a large bowl. Set aside. Preheat oven to 350F degrees. Line two large cookie sheets with parchment paper or silicone baking mats. Set aside. Remove the cookie dough from the refrigerator and roll 1.5 Tablespoons of dough into each ball. You'll have about 20-24 balls, give or take. For the rolling: Mix the sugar and spices together in a small bowl. Roll each dough ball into the mixture to coat evenly. Place 10 balls of dough onto each cookie sheet. Bake the cookies for 10-11 minutes. The cookies will look very puffy, soft, and under baked. That's ok. Remove from the oven and allow to cool on the cookie sheet for at least 10 minutes before transferring to a wire rack to cool completely. For the frosting (frosting is optional): With a handheld or stand mixer fitted with a paddle attachment, beat the butter on medium speed until creamy - about 2 minutes. Add confectioners' sugar, vanilla extract, cream, and vanilla bean seeds with the mixer running on low. Increase to high speed and beat for 3 full minutes. Add 1 Tablespoon more cream if frosting is too thick. Taste and add 1/8 teaspoon salt if frosting is too sweet. I always add the salt. Frost cooled cookies. There may be leftover frosting depending how much you use on each cookie. Sprinkle with extra sugar/chai spice topping if you have any left, if desired. Cookies stay fresh covered at room temperature for 1 week. Make ahead tip: Unfrosted cookies freeze well, up to 2 months. Coated cookie dough balls freeze well, up to 2 months. Allow to thaw overnight in the refrigerator and bake as directed. 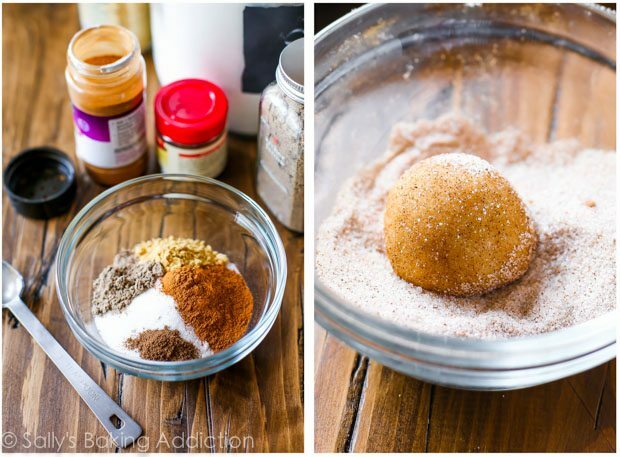 Try my Caramel Surprise Snickerdoodles next!